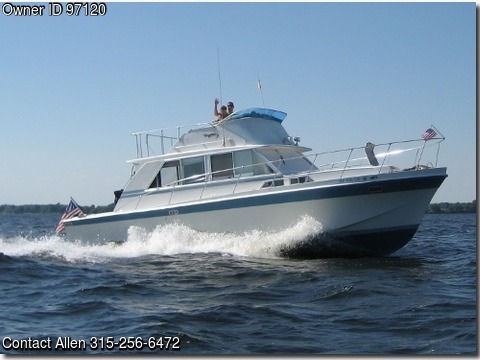 1972 Uniflite 36 Flybridge Sedan — We have owned this boat for over 24 years enjoying the fun and excitement of boating on Lake Ontario and the surrounding waterways (fresh water boat). The openness provided by the double-sliding doors between the cockpit and salon (no steps) and sleeping accommodations for 6, makes this boat ideal for hanging out at anchor with family and friends or extended cruising. Primary features include two control stations with VHF radio, compass and depth sounding (bridge and salon). Furuno 1670 GPS/fish finder combo (bridge 2013). Easily sleeps 6 (forward v-birth, starboard bunks, salon pull-out), head with shower capabilities, electric heat, 3 burner range with oven and two refrigerators/freezers. Propulsion and Generator: Twin Chrysler 440/330hp, 6.5kW Onan on-demand AC generator (new armature installed 2011). Measurements: Length 36′ 0″, Beam 12′ 4″, Draft 3′ 4″, Clearance 12′ 3″. This is a lot of boat for the money!